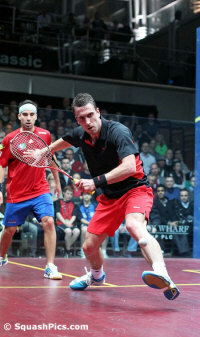 Daryl Selby withstood a determined challenge from Robbie Temple to become the first player to reach the quarter-finals. 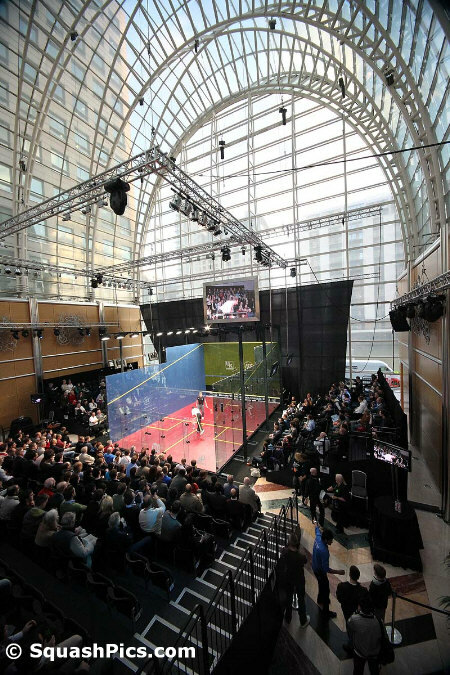 He began confidently, driving solidly and looking comfortable on the glass court. He opened up a 4-0 lead and built on that start to win the first game 11-6. He created a similar advantage at the start of the second game but Temple fought back to trail by a single point at 5-6 and 6-7. 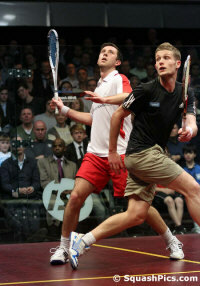 But Selby finished strongly to win it 11-7. Temple again trailed at the start of the third game but hit back from 3-0 down to draw level at 4-4. But Selby edged ahead and, attacking freely and striking the odd nick, he closed out the match as a frustrated Temple had no luck with appeals to the referee. "Robbie played very well and it was never easy. 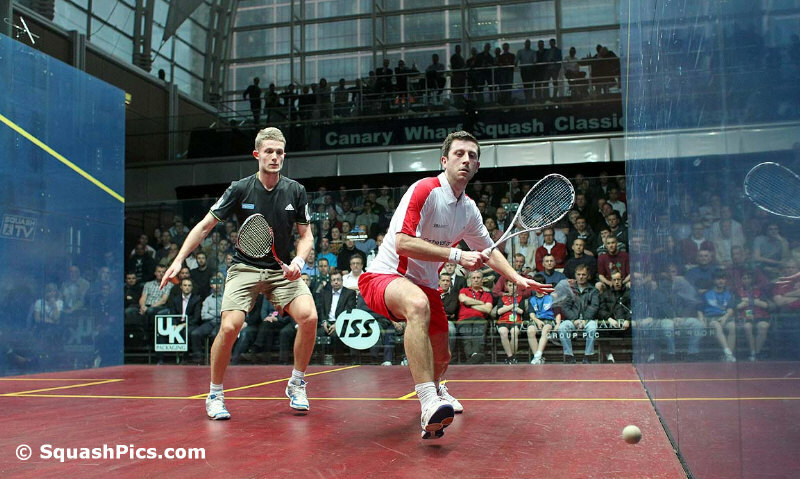 We have a lot of young English players coming through, plus Nick and James battling it out at the top of the rankings. "That’s good for them, but that’s where I want to be." Peter Barker cruised to a comfortable victory against Hungarian number one Mark Krajcsak, winning 11-2, 11-5, 11-3 in just 29 minutes. Apart from one brief sell in the second game, when Krakcsak drew level from 4-1 down, Barker was in complete control. He was happy with his mobility after recent rehab work to treat a knee injury, and will be enjoying a rest day before the quarter-finals. 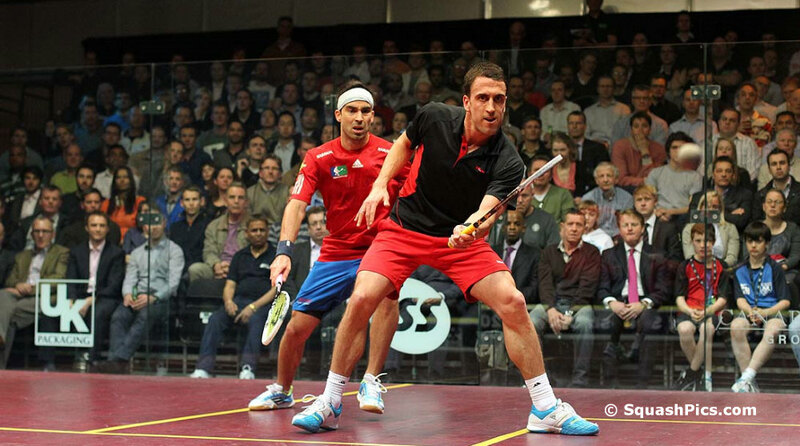 Barker's quarter-final adversary, German number one Simon Rosner, will provide considerably tougher opposition. 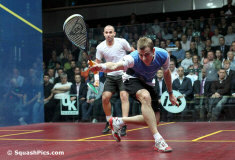 The world number 18 from Paderborn overcame 22-year-old London qualifier Adrian Waller in straight games. 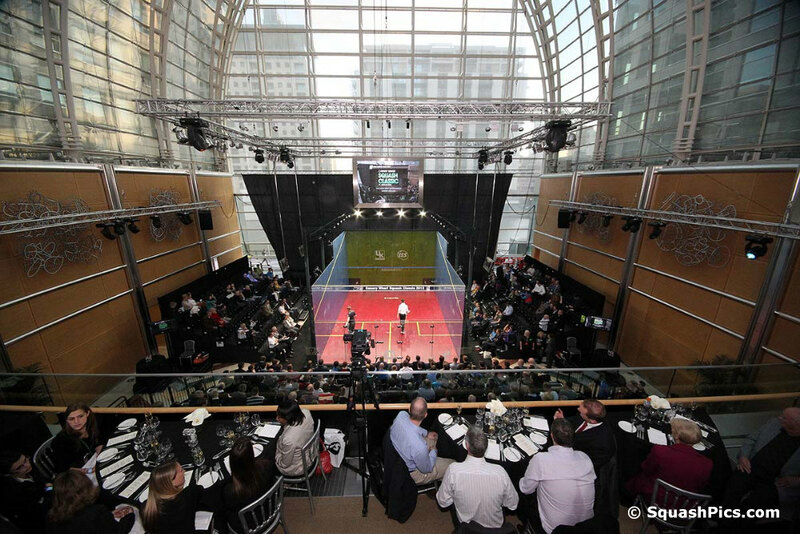 Space on court was at a premium in a match featuring two 6ft 3in combatants. In the opening two games, the scoring was close until the middle phases, when Rosner raced ahead. In the third, Rosner led 8-1 before left-hander Waller suddenly found a spell of inspired form to make the scoreline look much more respectable. 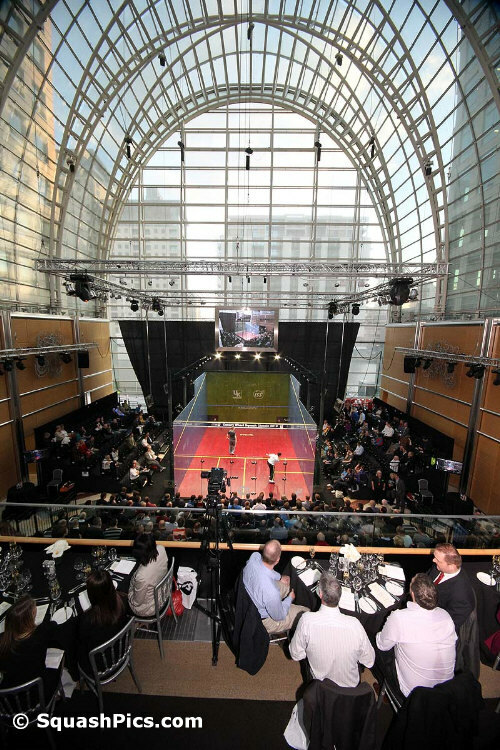 World champion Nick Matthew was held up by his Egyptian opponent Ali Anwar Reda before claiming a place in the Canary Wharf Classic quarter-final. 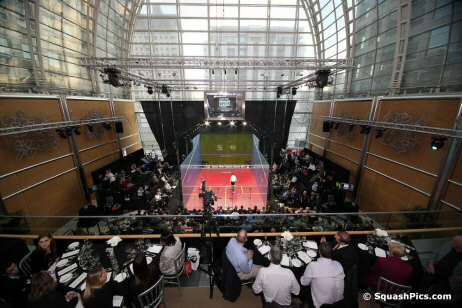 He was also held up by an unusual emergency announcement during the match informing a member of the full-house crowd at the East Wintergarden that a donor kidney was available for an emergency transplant at Royal London Hospital. 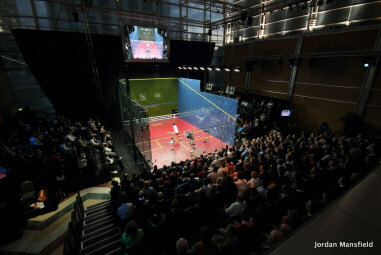 Matthew was playing his first PSA match since losing to another Egyptian, Ramy Ashour, in the semi-finals of the North American Open. Reda surprised Matthew by winning the second game. Matthew was in control for the majority of the first game and led 9-6 in the second, but Reda hit back with a succession of tight drives and accurate drops to win it 12-10. 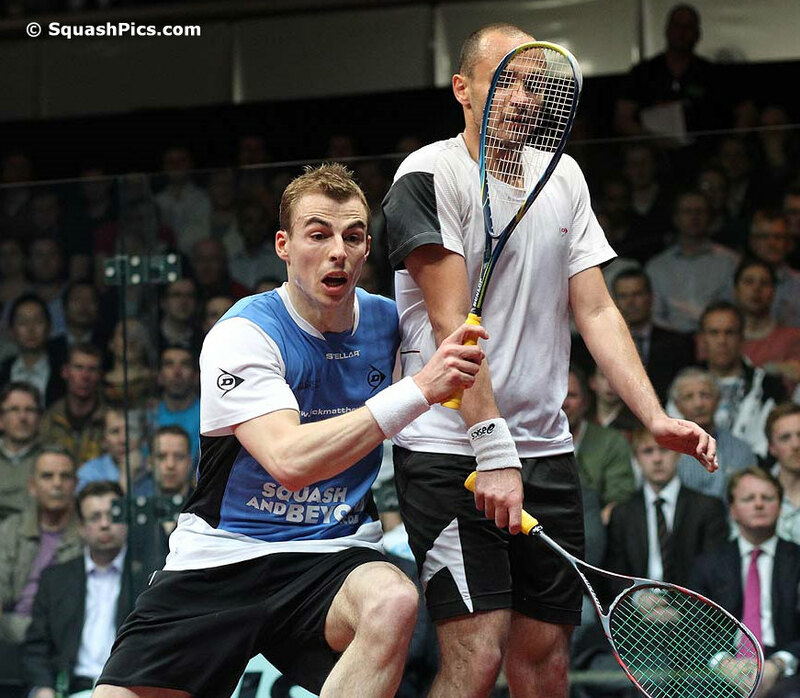 Matthew regrouped mentally in the third game and imposed himself on the match once more. From 5-5, he stepped up the pace, hitting tight, crisp drives to all parts of the court to win six points in a row. Matthew maintained the pressure at the start of the fourth game to lead 5-1 but Reda rallied to draw level at 5-5 and again at 6-6. From then on, Matthew stepped up the court and attacked superbly. He had Reda running from corner to corner chasing an array of winners from the world champion. "It has been nice to have some time between tournaments to work on different things. “There is a difference between training fitness and match fitness and tonight was a good hard match to start the tournament with to get time in on court. “Having said that, I know I will need to play better against Daryl Selby on Wednesday." Daryl's experience showed tonight against Robbie. The young man had a pretty heavy match yesterday, coming back from 2/0 to finally beat Omar Abdel Aziz in 92m, but it didn't show too much, and quite on the contrary, I felt that Robbie was getting more comfortable on the glass and with his shots as the match went on. To be noted that young Robbie actually changed hands during the match, and even found a stunning crosscourt volley nick with his right hand, bless him. Still, he had a lot of physio on it, and is brand new. He certainly look pretty comfortable and moving extremely well on there. Mark, well, never looked in the match, is he injured? Not sure, but so many unforced errors, and Peter, just cruised 3/0 in less than 30m. No walk in the Olympic Park for Nick tonight. Although it looked that way in the first. Suddenly, Ali Reda found his rhythm and really made his mark in the second. A true battle, long rallies, intense, with the Egyptian fighting first to save 2 game balls at 10/8, then getting the game 12/10. Nick felt how dangerous and explosive the situation could be. 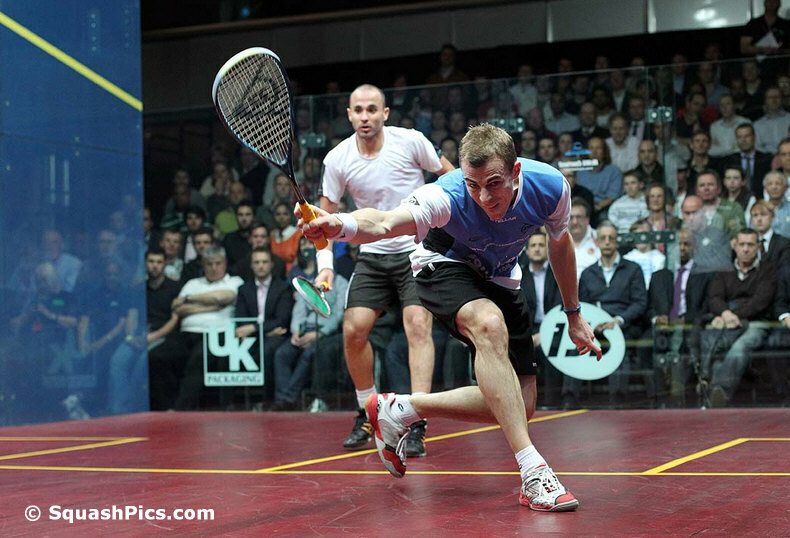 The third was extremely close up to 5/5, when Nick just found the accelerator, leaving his opponent breathing his dust, 11/5. But Ali Reda fought hard and with so much heart tonight yet again, and it was touch and go till the end, Nick was never able to relax, and the crowd fully enjoyed the match. To be noted, a few overturned decisions by the video ref, against Nick funnily enough, which led the Englishman commenting "I would like to have a few words with the video ref, asking him what did I do to upset him !" 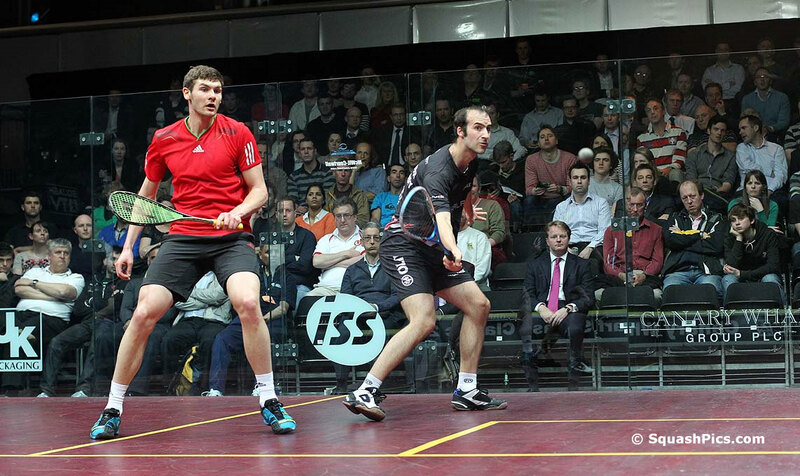 Adrian Waller couldn't make it four out of four for the English contingent, although he pushed Germany's Simon Rosner hard in the first two games. Unforced errors were his undoing as the German opened up leads from mid-way through each of the first two games, and Waller couldn't recover from a slow - 1/8 - start to the third as Rosner, looking as solid as ever, moved into the quarter-finals.